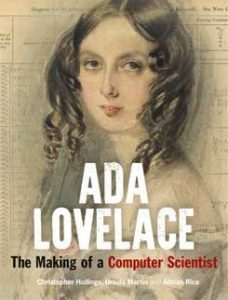 All are welcome to the Town Hall on Thursday 9 May at 19.30 to witness the unveiling of a plaque for Ada Lovelace, the mathematician and computer pioneer. Ada lived and was married in Ealing in 1835 at Fordhook, the country house rented by Ada’s mother, Lady Byron, at Ealing Common. It was located near the junction of Fordhook Avenue and Byron Road and was demolished in 1903 and replaced by houses. We are grateful to South Acton Ward Forum for funding the plaque which will be unveiled by the Earl of Lytton, a direct descendant of Ada Lovelace. Before the unveiling, the John Delafons lecture will be given by Professor Ursula Martin CBE FREng FRSE, co-author (with Christopher Hollings and Adrian Rice) of Ada Lovelace: the making of a computer scientist, published by the Bodleian Library in 2018. We hope to have copies of the book available for purchase after the lecture. The plaque will be placed at a later date on the west side of the building occupied and owned by Grimshaw & Co Estate Agents at the junction of Fordhook Avenue and the Uxbridge Road. See our events page for further information.